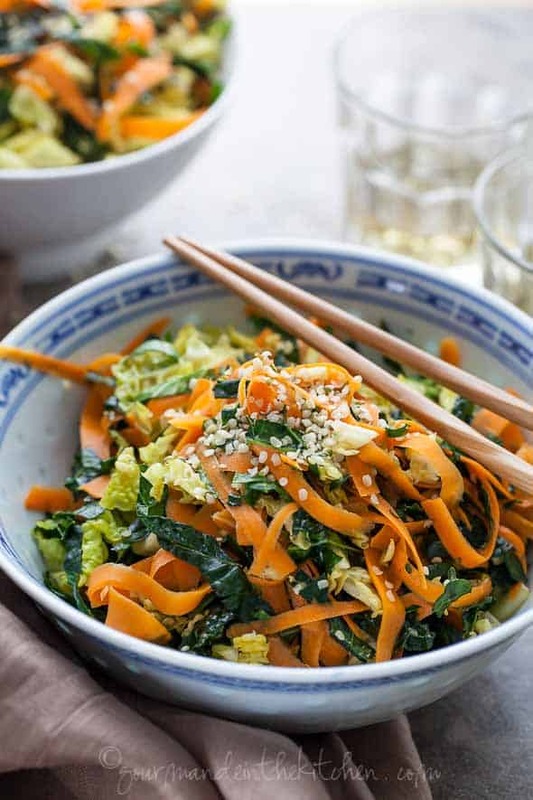 This Asian inspired kale salad features a chiffonade of kale, cabbage and carrots tossed in a maple-sesame vinaigrette. From smoothies, to chips, to salads, Kale is the vegetable of the moment. 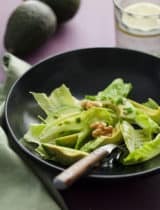 Rather brash and forward with its rough texture and bitter flavor this nutrient dense green just needs a bit of love to coax out its softer side. Luckily all it takes is a little bit of your time and the right recipe. This salad could be the one. 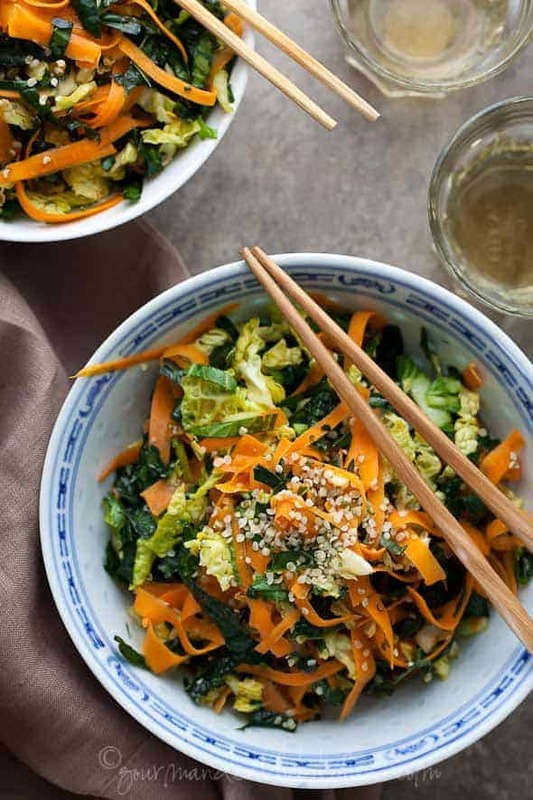 A variation on a traditional chopped salad, this sliced version features a chiffonade of kale, cabbage and carrots tossed in an Asian inspired maple-sesame vinaigrette. Its bright clean flavors are a welcome change of pace in a season of heavier fare (I’m looking at you Thanksgiving). The long pebbled leaves of Tuscan (Lacinato) kale are more tender and delicate than its curlier cousin and works especially well in raw salads. A good rub down with a slick of olive oil and the once sturdy leaves soften into silky green noodles. 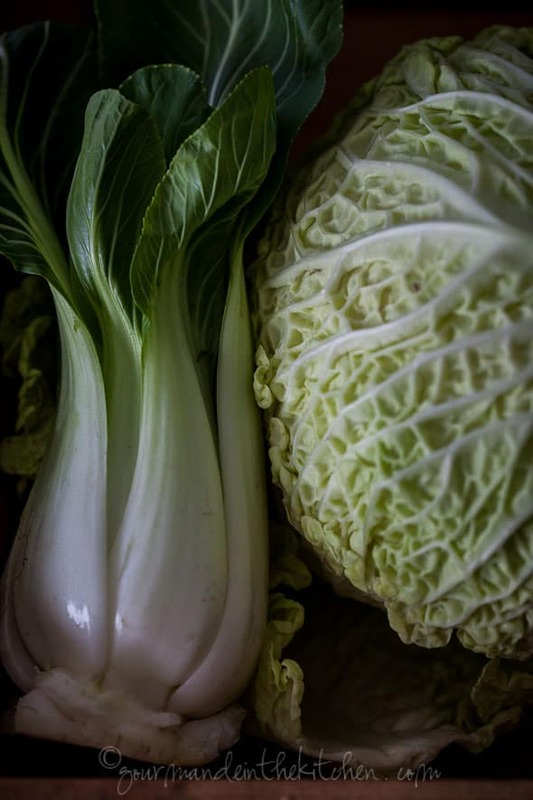 Add a cool and crunchy mix of sliced Napa cabbage, baby bok choy and shaved carrots and you have the beginnings of a decidedly fresh and easy dinner. 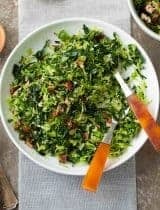 Unlike lettuce, kale salads can sit dressed and taste even better when given a little extra time to marinate and soak in the slightly sweet and toasty notes of the maple-sesame dressing, making it a natural for potlucks and parties. Or if you’re like me, eaten settled into the couch with a big bowl, a pair of chop sticks and a good glass of wine. 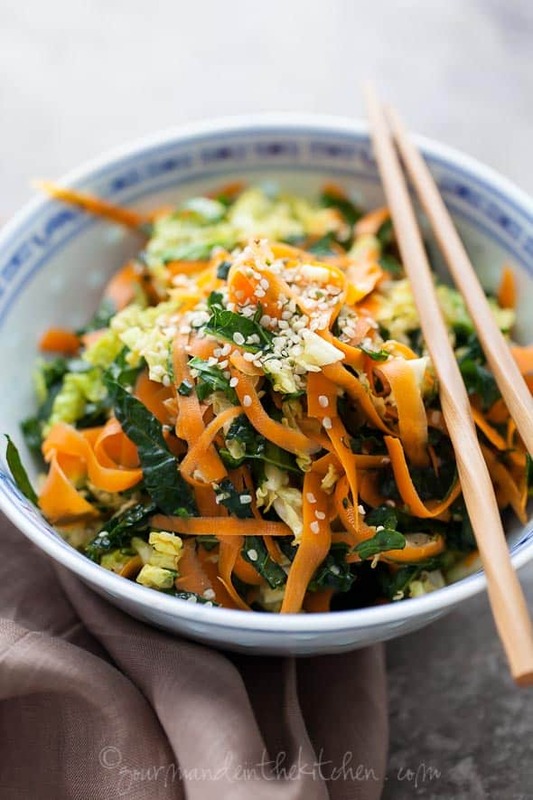 A variation on a traditional chopped salad, this sliced version features a chiffonade of kale, cabbage and carrots tossed in an Asian inspired maple-sesame vinaigrette. In a small bowl, whisk 1 Tablespoon of the olive oil, the sesame oil, apple cider vinegar, maple syrup, soy sauce and minced garlic. Strip the stems from the kale leaves and roll the leaves in a chiffonade to slice into very thin strips. In a large bowl combine the kale and remaining Tablespoon of olive oil. Lightly massage the kale leaves with your hands until the leaves soften and begin to wilt (about 30 to 60 seconds). Place in large serving bowl and add the shredded cabbage, bok choy, carrots and dressing tossing well to coat. Let the salad stand for 10 minutes to marinate. Top with hemp seeds or toasted sesame seeds and season with freshly ground pepper to taste if desired and serve. I think I'd like to eat kale just like this. I often find it too bitter, even when made into chips. Maybe the variety I'm buying or where it's grown makes a difference. I'm determined to like kale because it's really good for us. Ahhhhhh....this could make a kale lover out of anyone! What a stunning salad...and the Asian dressing with the maple twist sounds divine!!! I love kale and you're like the fifth blog I've been to today who's done a kale salad and after all these reminders, I think I need to pick up some kale tomorrow :) Gorgeous photos as always! I've started eating more kale this year. Definitely a yes from me. That looks so nourishing! Yum, love kale! Love, love. The chips, salads, and most recently, sauteed with onions and garlic with a bit of balsamic vinegar. Man, I could eat that stuff everyday.... wait, I DO! After an evening with cocktails and ice cream cake, I need something wholesome like this! I love kale and am all over this salad. Can't wait to give it a try! i love kale, but typically only in soups or roasted like chips. i still haven't fallen totally in love with the kale salad, but maple sesame vinaigrette? gotta try! Okay, I love kale and I have never found it to be bitter! I know other people do, so I'm guessing I must be missing a tastebud or something. :) This would be so fantastic for Thanksgiving! I love kale, but I tend to stay with the same recipe (stir-fried with garlic and chili) all the time. This is a good one! I have some tuscan kale I was waiting for an inspiration to use, so thanks! It looks delicious, and the colors! I have been loving raw kale salads as of late. This one looks like it needs to enter into the rotation. 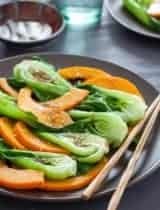 I love those carrot ribbons and this Asian inspired dressing is right up my alley! I would not mind a bite of this salad... or the entire bowl! So so pretty! 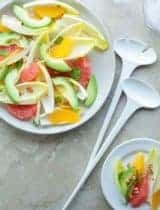 As much as I love salad, I usually want warming foods in the late Fall and Winter but this is beautiful and a perfect salad for cool weather. I LOVE kale! 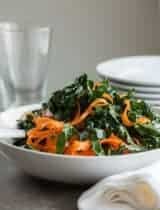 We eat raw kale salads at least once a week - can't wait to try this version!!! oh you make the prettiest salad! This looks rawsome!! love it and definitely trying this out on the weekend. Found your blog through pinterest and I love it. Another kale lover here. But seriously, this whole salad is making my mouth water. I'm on my own for supper (kids are in bed) and I think I'll raid the fridge for my own version. I love Kale and can't wait to try your recipe!! Beautiful salad, I love your vinaigrette! Some similarities with coleslaw [this from an Oz gal just learning to eat cavolo nero! ], but absolutely love the dressing which will be made for the weekend :) ! I could eat this gorgeous salad for days. I make something similar with shredded apples, and avocado oil dressing. Kale can certainly be delish raw if massaged enough. I love kale but have only ever eaten it steamed or as crisps. This looks like a lovely way to serve it - sesame seeds are always a delicious addition to any salad! I have to say that although I didn't love kale at first, now it's one of those things I can't live without. Kale chips and raw kale salads are my go-to recipes for using up kale. Looking forward to trying your recipe! Such a beautiful salad Sylvie; I do love my kale! I think this would be great before Thanksgiving dinner, too! I adore kale, but for whatever reason, I always seem to forget about it. Thanks for the beautiful reminder, Sylvie! I didn't used to like Kale, but i have been making all these dishes with it and starting to really like it. The best part is that my little 8 month old loves Kale and spinach. Makes me so happy! This salad is just gorgeous. My kind of salad :) Just gorgeous! I'm not obsessed with it, but quite like Kale. (Why did I just capitalise that? Anyway...) This salad looks like my kind of side or supper. I tend to add sesame seeds to a lot of things. Lovely recipe Sylvie! Saw this recipe on Pinterest. I think kale is ok-but pretty much eat it because it is healthy. My husband is definitely not a fan. After convincing my husband to let me make the salad-we were both impressed. Think it will become a regular at our house. Great texture and dressing was really good. I used toasted sesame oil which I think brought more flavor. I love hearing that, I'm glad you both enjoyed it! I, for one, absolutely adore kale salads like this one. Looks fantastic, Sylvie! this looks beautiful and delicious Sylvie! i could see me using that dressing combination in and on so many things. Would be great with couscous and maybe quinoa! What a beautiful salad- who said salads have to be bland and boring! not i! not you! I have been making raw kale salads all week. However, I love your asian take on this one! For me, this is next on my menu! Your gorgeous salad came across my timeline and caught my eye! Now you have a new fan and follower! Never tried eating Kale raw. Salad looks colorful indeed! Yes, I love kale and I love this salad very much! Maple sesame vinaigrette got my attention too. Looking at your beautiful ingredients/vegetables pictures, I think some people who don't like veggies would even want to give this salad a try. So beautiful and appetizing! Simply beautiful. Love, love, love kale! Raw, cooked, I'll eat it all. This looks so refreshing! Thanks Mara, I'm so glad you liked it, that always makes me happy to hear! This looks fantastic. I can't wait to try it!!!! I love kale salads! This version looks right up my alley, and kale is luckily making it's seasonal appearance in our neighbourhood. Thanks for sharing! My husband needs to supplement his diet with Kale. I had a head of cabbage, too many carrots, and a bunch of Kale. I searched the internet for a salad recipe using these veggies for our Christmas dinner. The dressing ingredients were in my pantry. The salad was a great compliment to the ham and turkey. My husband ate it up, and so did I.
I'm glad you and your husband enjoyed it! Sylvie, Do you use TOASTED sesame oil in here (ie: the DARK one) or the light, untoasted variety? Either works, but I think the toasted kind gives a nicer flavor here. Thank you so so much for the info about the coconut aminos! 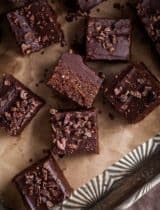 I hadn't heard of this product, and I've been avoiding any recipe with soy sauce because my son is allergic to soy, and so we avoid it in general. Anyway, thank you, and also thanks for a great-looking recipe. I'll be trying it this week! I tried your salad today while preparing food for a "starving student" and I love it. It is definitely a keeper. My vegan college student daughter will love it too, I have no doubt. Thank you so much for sharing it. Lovely salad!!! I added a half tbsp of fish sauce to the dressing. 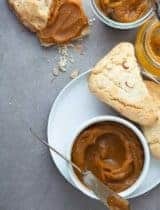 I think your recipe is excellent, thanks for posting!!!! 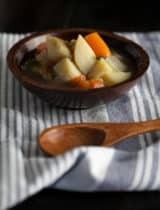 Being primarily a meat and potatoes kind of guy, I have been branching out over the past year exploring new ingredients. Kale was always something that made me slightly uncomfortable, until now. I picked up some on the weekend to "play" with and remembered your recipe so based dinner on this plan. It was really eye opening. 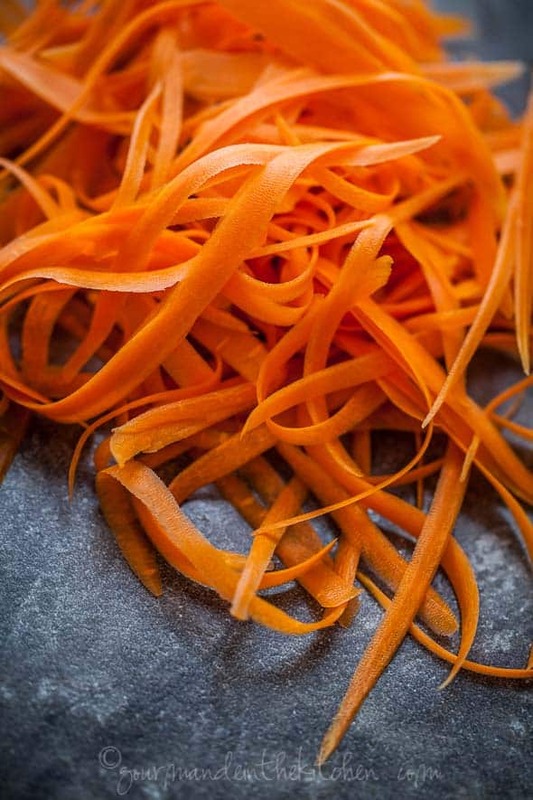 Great textures and balance with the rest of the ingredients; and ribbons of carrots are a win in any recipe ;). Thanks for the subtle push into the world of "other greens"! Now that's the best kind of compliment, glad to hear that! I made a salad very similar to this and wanted a sesame maple dressing to go with it. I made this dressing and added a little tahini to it. I used brown rice viegar and coconut aminos. Very delicious. I modified this with added protein for dinner tonight. I doubled the dressing as I usually like extra on my salads. Delicious! Thank you, I appreciate you saying so! You're welcome to link back to them on your page. The way you shaved your carrots here inspired me to create a Moroccan flavored carrot salad. The carrots had the most wonderful texture! Thank you for keeping things so fun and interesting in the kitchen:) If you'd like to check it out, it's on my site!